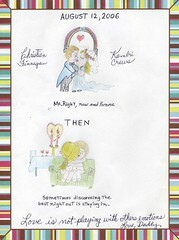 I'm getting married in less than two weeks so Dad sent me the drawing below with a little last minute advice tacked on. that really is very sweet. It really is a shame he is in jail and not able to see you marry. I just found your blog, thanks to Conor's blog. It is fascinating. Truly fascinating. Your dad sounds like a remarkable person, and so do you. Best of luck with your wedding and your marriage. It's a shame your dad can't be there. But you know that he'll be thinking about you. If you ever want to join the deaf community in NYC. Drop me a line.